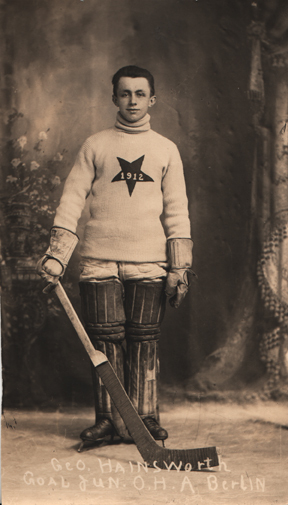 George Hainsworth played for the Kew Beach Toronto, City Senior team in 1917. His son, Bill tells me that this was probably in the Balmy Beach area which is (or was) a suburb of Toronto. 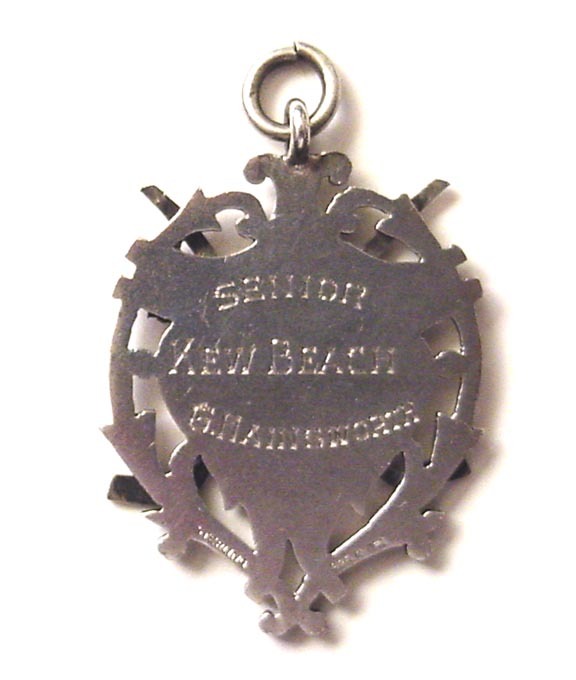 This medal was presented to him for being champions of the City Senior league that year. From 1917-1922 he played for the Kitchener Greenshirts of the OHA Sr. League and then played for the Saskatoon Crescents of the WCHL from 1923 until 1926. He then joined the Montreal Canadiens for the 1926-27 season. 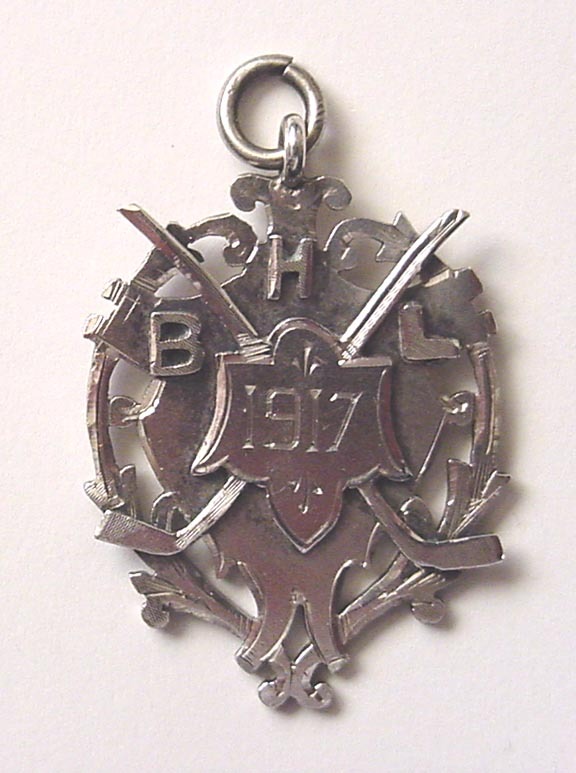 This is most likely one of the earliest pieces of memorabilia avilable from the great Hainsworth's playing days. 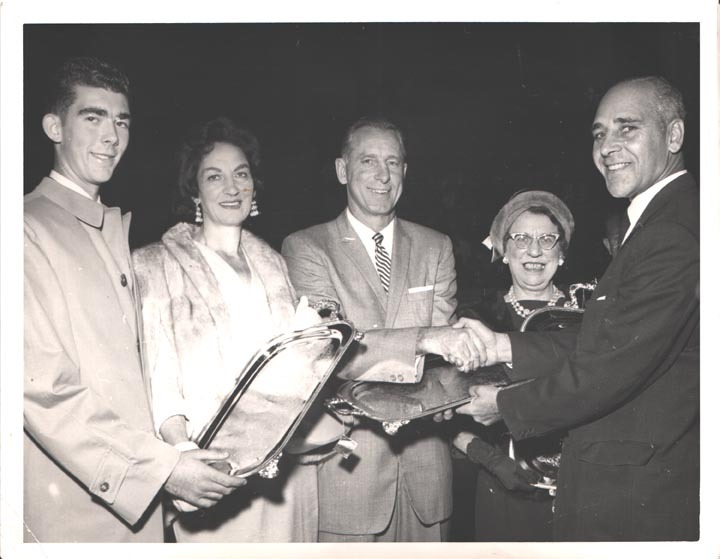 The photo on the right shows at least three people being presented with these silver platters on October 4th, 1961. The lady on the far right in the photo is the widow of George Hainsworth, who tragically had been killed in a car accident in 1950. 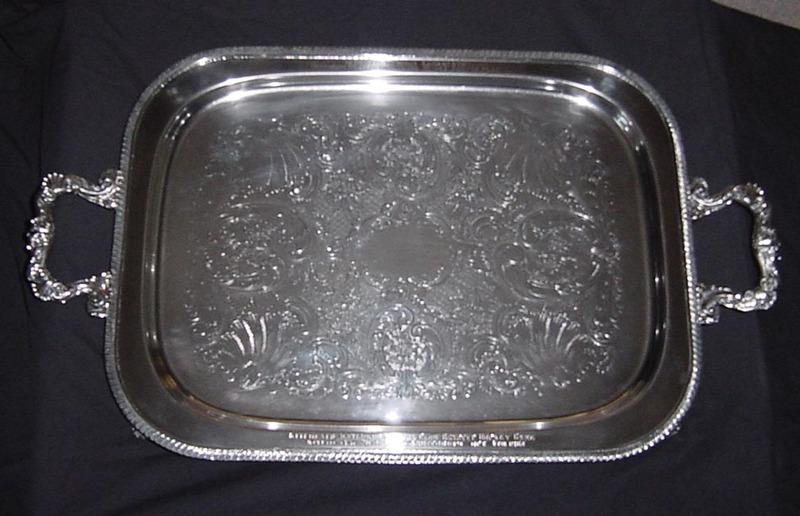 She is receiving the tray (pictured above) on his behalf. 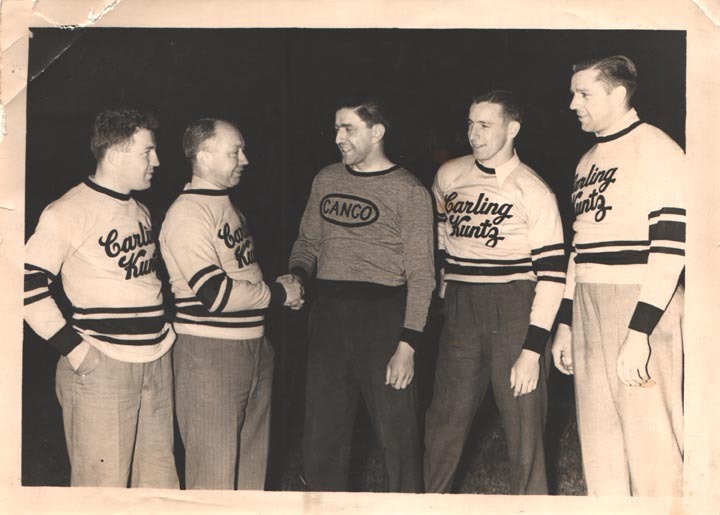 I can identify the gentleman in the middle, receiving his tray and shaking hands, as Milt Schmidt. 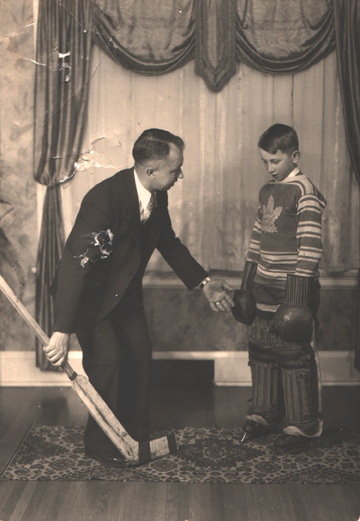 George Hainsworth began his minor hockey when the family moved to Berlin, Ontario (renamed Kitchener after the First World War). 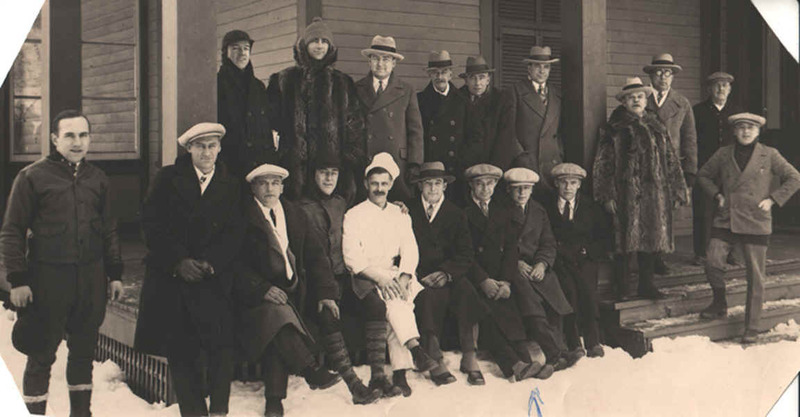 The 5'5", 180 pound netminder starred with the Kitchener Juniors of the Ontario Hockey Association and quickly moved up through intermediate and senior ranks winning the Allan Cup in 1918. 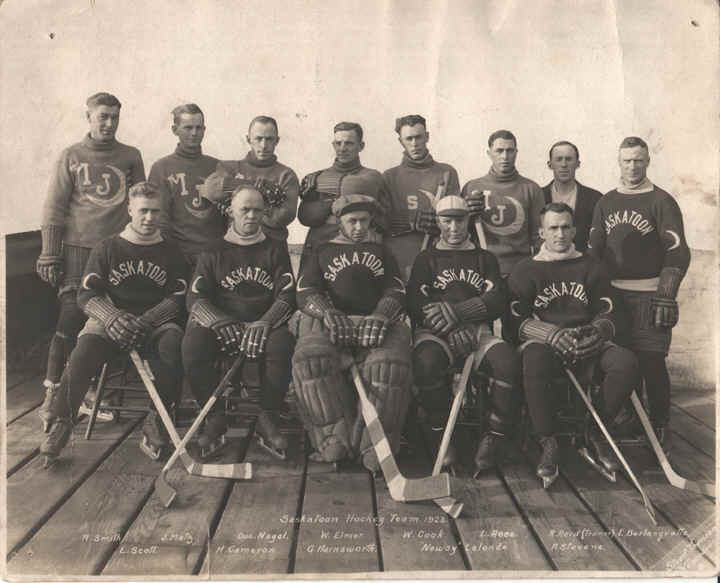 Hainsworth launched his pro career as a 28 year old rookie in the Western Canada Hockey League with Newsy Lalonde's Saskatoon Crescents (later the Sheiks) and starred for three years until that league folded. Upon the recommendation of Lalonde, he replaced Georges Vezina in the Canadiens goal. At 31 years of age, Hainsworth was an experienced rookie who wasted no time in establishing himself in the NHL. Assuming the goaltending mantle from Vezina for the 1926-27 season, he became the first winner of the Vezina Trophy as the best goaltender in the NHL for allowing the fewest goals over the course of a season, and captured the award for the next two seasons as well. He won a pair of Stanley Cups with Montreal, in 1929-30 and 1930-31. 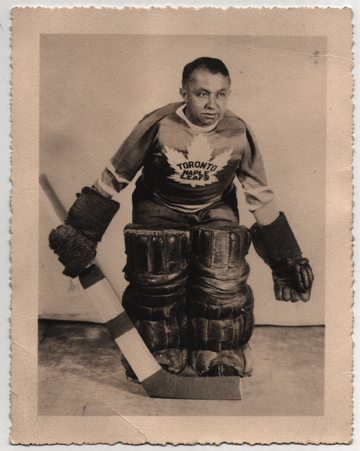 In 1928-29 he set two records for goaltending that will never be challenged. He turned in 22 shutouts in 44 games and posted a goals against average of 0.98 goals allowed per game. Because of his calm, unflappable nature used to drive opponents to distraction while lending confidence to the Canadiens players, Hainsworth received an unusual accolade when he was appointed team captain in 1932-33. He possessed the ability to communicate his confidence and calm to his teammates through solid, sometimes spectacular performances. Over the course of his career with the Canadiens, Hainsworth logged 75 shutouts in the regular season and six more in the playoffs while maintaining a goals against average of 1.85. 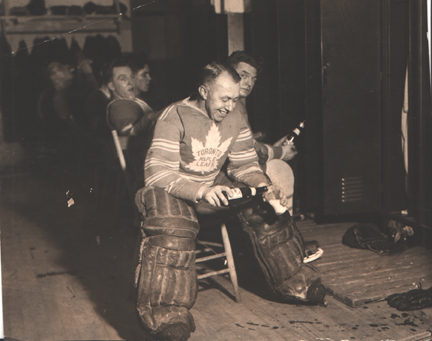 During his seventh year with the Canadiens he was traded to the Toronto Maple Leafs for fellow netminder Lorne Chabot. In, Toronto, he posted goals against averages of 2.48, 2.28 and 2.20 in three full seasons. He started a fourth season with the Leafs but was replaced with an impressive rookie named Turk Broda. Hainsworth returned to the Canadiens in 1936-37 before retiring from professional hockey. George Hainsworth and the "Kraut Line"
George Hainsworth, Canadiens goalie, was the league's leading goalie last season in the matter of having the greatest number of shut-out victories to his credit. This season Hainsworth is just as hard to beat.